https://sep.yimg.com/ay/yhst-33477391359232/black-and-white-heniochus-butterfly-fish-heniochus-acuminatus-long-fin-butterfly-schooling-bannerfish-8.jpgBlack and White Heniochus Butterfly Fish - Heniochus acuminatus - Long-Fin Butterfly - Schooling Bannerfish EasyPeaceful100 Gallon9.8 inchesNoOmnivore, BrineIndo-PacificChaetodontidaeSmall 1" - 2"
The Black and White Heniochus Butterfly Fish is also known as the poor man's Moorish Idol. While the Black and White Heniochus Butterfly Fish looks similar to the Moorish Idol the Black and White Heniochus is significantly different. It is much easier to care for captivity and is one of the hardier butterfly fishes available. They are very attractive with black and white broad stripes and long streaming dorsal fins much like those of the Moorish idol. It is a very active fish and should be housed in a tank of at least 55 gallons. It will tolerate members of its own kind in the same aquarium, as long as they are introduced to the tank at the same time. Members of a captive group will form a dominance hierarchy. Individuals fight for dominance by butting foreheads and trying to push each other backwards and when they display at each other. It will sometimes clean other fishes. This is a zooplankton feeder that can be housed with corals and other ornamental invertebrates. An occasional individual may nip at Xenia or other soft corals. Most specimens are around 2.5-3.5"
The Black and White Heniochus Butterfly Fish will feed on most types of food offered to it, including flake food, but is especially likes clams and mussels. It is found in the tropical Pacific Ocean and is quite common in the pet trade. It is not aggressive and gets along with other fish; however, care should be taken to avoid fish which might pick on its long pennant style dorsal fin. The Black and White Heniochus Butterfly Fish, because of its wide appetite range, is not considered reef safe, as it will attempt to eat some corals. This fish is reported to reach lengths as large as seven inches in the wild, though captive individuals may not grow this large. This butterfly fish does well singly or in groups. In a large enough aquarium these fish may school. Social Behaviors:Found alone, in pairs, or in small groups. This fish likes company of its own kind. Maximum Size: Black and White Heniochus or Bannerfish adults can grow to 20 cm (8 inches). General Size Specifications: The small size will come to you generally 1 to 2 inches; the medium generally 3 to 4 inches; the large generally 5 to 6 inches not including the caudal fin. Minimum Tank Size: A minimum 50 gallon aquarium is recommended. Water Conditions: Keep water quality high (SG 1.020 - 1.025, pH 8.1 - 8.4, Temp. 72 - 78� F). Habitat: Black and White Heniochus or Bannerfish are found in the Indo-Pacific region and the Red Sea. Feeding and Diet: Apparently young specimens have been known to act as cleanerfish, eating parasites off of other fish! It prefers a diet of small meaty foods and herbivore preparations. 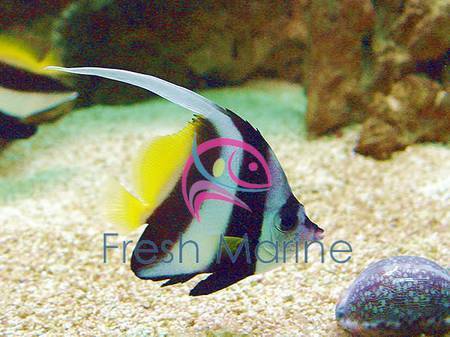 Breeding: The Black and White Heniochus Butterfly Fish is an egg-scatterer.